Why pay for expensive hummus (hamos, houmous, hommos, hommus, hummos, hummous or humus) from the grocery store when it's so very easy to make yourself? You don't even need a recipe, since the proportions are all to taste. The only things missing from this lineup of ingredients are lemon juice (I forgot to pull out a cube for the photo) and salt and pepper. Mince some garlic, and shallots if you have them, and brown them in a little olive oil. You can use raw if you like that. 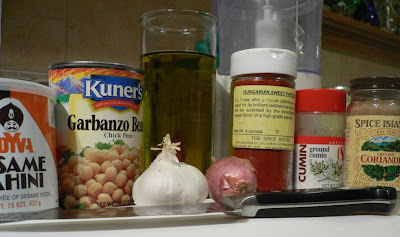 Drain the chickpeas, reserving the liquid. Put about a fourth of the liquid with the beans in a food processor (I have a little one that's perfect for jobs like this). Add the garlic and onions, a spoonful or two of tahini, a squeeze of lemon juice, and any other seasonings you might like, such as cumin and coriander. A pinch of salt and pepper. Also a drizzle of olive oil. Process until smooth, adding a little more oil if it's too thick, or some lemon juice. Taste it! Adjust the seasoning as desired. Garnish it with sprinkled paprika and a sprig of green. Put it on sandwiches or eat it as a dip for pita bread and vegetables. You can try so many variations of this. Roast some red peppers and toss those in. Toast a huge amount of garlic. Grate some fresh lemon zest. Add a little cayenne or tabasco or sriracha for heat. It's all good! homemade hummus is so much better that anything you can buy. Although I've never tried sauteeing the garlic beforehand. A must do the next time. Yum. 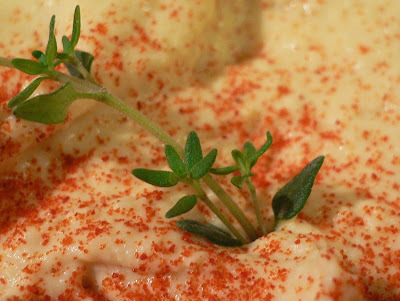 Hummus is one of my favorite dips/spreads. It is so quick and easy to make! Hi cef! I like your spelling. I could definitely make a dinner out of this stuff. meresy, I sautee it because I find raw is a little too potent for me, especially in something I'm going to eat at work. I like the sweeter, mellower flavor of it sauteed. Breezy, if I felt obliged to keep up with everyone's recipes, I'd be cooking 24 hours a day and weigh 300 pounds. Kevin, I just saw your roasted garlic version (checked to see if you had one). Sounds even better! I've read that hummus is a popular breakfast food in the middle east -- just in case you were interested in expanding your breakfast and/or hummus horizons. Oh, I could totally eat a bagel with hummus for breakfast, Julie. Good energy food! It sure disappears fast, though. I never realized it was so dang easy to make!! !